The 2018 Toyota Sequoia is the company's biggest SUV, with 3-row seating and a new suite of standard driver-assist features including pre-collision warning and automatic braking. While the Sequoia's 7,400-pound tow rating falls short of its competitors, we think it will work for most family hauling needs. The Sequoia's ability to venture off-road is another bonus. If a solid reputation for reliability, resale and capability mean more to you than maximum towing and fuel-economy figures, the 2018 Toyota Sequoia earns two thumbs-up. New standard safety features further improve an already great SUV. If you're looking for a more modern design, better horsepower and tow ratings or more interior room, you'll be better off shopping the big SUVs from Chevrolet/GMC, Ford and even Nissan. Those seeking 7- and 8-passenger seating in a car-like SUV might like the Toyota Highlander or Chevrolet Traverse. For 2018, the Toyota Sequoia gains Toyota's Safety Sense-P that adds automatic emergency braking, lane-departure alert with sway warning, adaptive cruise control and auto high beams. A blind-spot monitor and rear cross-traffic alert are also standard. Along with refreshed styling comes a new TRD Sport trim. The 2018 Toyota Sequoia SUV is a true 8-seater, with a 3rd-row seat that really will accommodate adults and is easily reached, thanks to big rear doors and sliding 2nd-row seats. The 3-passenger 2nd-row bench seat allows individual sections to slide fore-and-aft and also fold flat. Noteworthy options include captain's chairs for the second row and a power-folding feature for the third row. Basically, the Sequoia's interior will swap around into any configuration needed. The design is somewhat bland and a couple notches below sinfully luxurious but, as would be expected of a Toyota, the assembly detail is without fault. In all its majestic glory the Sequoia for 2018 is the longest, widest and tallest full-size SUV Toyota builds and, with its long wheelbase, it appears even longer. But that long wheelbase pays dividends -- it enhances interior room, improves ride quality, contributes to directional stability and, with the resultant short overhangs, gives extra clearance when approaching steep angles. The Sequoia's appearance is fairly innocuous and can't be accused of standing out in a crowd, but with its new grille and front bumper, it's certainly not unattractive. While driving this big SUV is never going to compare to a lighter crossover SUV like the Toyota Highlander, the 2018 Sequoia proves remarkably easy to control. Despite its vast bulk, the Sequoia takes corners with confidence, and its independent rear suspension helps keep lean to a minimum while making off-road adventures all the more doable. This same setup, however, does return a rather firm ride, one that is livable so long as the paved road below remains smooth. Things improve vastly with the Platinum trim's air-spring suspension, but you'll pay a premium to get it. The Sequoia's steering is fairly precise, although it tends to feel a bit heavy at lower speeds, and its interior is well isolated from obnoxious levels of wind and tire noise. Standard rearview monitor, blind-spot monitor and rear cross-traffic alert are welcome assistants when attempting to maneuver the Sequoia's massive proportions. The rear-wheel-drive 2018 Toyota Sequoia SR5 has a Manufacturer's Suggested Retail Price (MSRP) starting around $49,600, while the mid-level TRD Sport and Limited start just over $52,300 and $58,000, respectively. Opting for 4-wheel drive will add a few thousand more, and the top-of-the-line Platinum model starts at about $65,500. Overall, the Toyota Sequoia's price range overlaps those of the Ford Expedition, Chevrolet Tahoe and Suburban 1500, but is slightly more expensive than the Nissan Armada. Before heading off to the dealer, a check of the Kelley Blue Book Fair Purchase Price will show what other buyers in your area are actually paying for the 2018 Sequoia. For a longer-term investment, the Sequoia is excellent and should hold its resale value better than any other large SUV. There are four trim levels for Toyota's 2018 Sequoia SUV: SR5, TRD Sport, Limited and Platinum. Standard equipment on the SR5 includes integrated fog lights, power tilt/slide moonroof, rearview camera, roof rack, 3-zone automatic climate control, Optitron instruments, leather-trimmed tilt/telescoping steering wheel with Bluetooth hands-free telephone controls, 8-way driver's and 4-way front-passenger's seats, 18-inch alloy wheels, all the expected power and convenience features, and Entune Audio Plus. The Limited adds a power liftgate, 20-inch wheels, leather seating and Entune Premium Audio. The Platinum adds perforated leather seating, Dynamic laser cruise control, Adaptive Variable Suspension, air suspension, and Entune Premium JBL Audio. All four of the Sequoia's trim levels -- SR5, TRD Sport, Limited and Platinum -- are available with either rear-wheel drive (RWD) or 4-wheel drive (4WD). Options for the SR5 include a Sport Package, with 20-inch aluminum-alloy wheels, and a Premium Package, with leather-trimmed seating, power-reclining fold-flat 3rd-row seat, heated front seats, and the Entune Premium Audio with Navigation and App Suite. Optional on the Limited is a rear-seat Blu-ray entertainment system with 9-inch display and 7-passenger seating with 2nd-row captain's chairs. The only option for the Platinum is the Blizzard Pearl exterior color. Full-size SUVs don't come cheap, so it's nice to know your hefty investment will hold its value for the duration of your loan. An excellent record of reliability and longevity also goes a long way to sealing the deal. While some manufacturers still require pricey packages or model upgrades to get these features, Toyota makes its TSS-P standard on every Sequoia. The system includes collision warning with pedestrian detection and emergency automatic braking, auto high beams, adaptive cruise control and lane-departure alert with sway warning. One of the best features offered in Toyota's full-size Sequoia is its strong and quiet 5.7-liter V8 engine, with 381 horsepower and 401 lb-ft of torque. It's unobtrusively reassuring and is equal to any task the Sequoia may be asked to accomplish. It's matched to a 6-speed automatic transmission that includes a low first gear for getting a heavy load moving and two overdrive gears that help enhance fuel economy and reduce noise at highway speeds. Taken together, the engine and transmission contribute to the Sequoia's towing capacity of 7,400 pounds. Toyota's 2018 Sequoia is a massive SUV renowned for its dependability and family-friendly hauling abilities. Although not as modern or roomy as the Chevy Suburban or Ford Expedition Max, the Sequoia still has much to offer, with 3-row seating and a new suite of standard driver-assist features including pre-collision warning and automatic braking. And, while the Sequoia's 7,400-pound tow rating does fall short of its competitors, we think it will work for most family hauling needs. The powerful 5.7-liter V8 is another proven component, offering plenty of muscle to move this big SUV around. Those looking to venture off-road will appreciate the Sequoia's Multi-mode 4-wheel-drive system that allows this rugged body-on-frame SUV to go places many of its competitors can't. Great safety features are included in my particular model. It has the side view blind spot detection which is great as that helps if you want to change lanes and might not necessarily see a car if it's sitting in your blind spot! Love that my Toyota Sequoia can fit 7 people. We have captain's seats in the middle row so only can seat 7 people instead of 8. Love that my rear seats are split and fold down as needed. I leave both down so have much more space when I go grocery shopping especially if I make a Costco run. Love that it has built in navigation. Still getting used to the voice command but sometimes it doesn't recognize what I'm saying so that can be a bit annoying. Overall very pleased with this car so far! 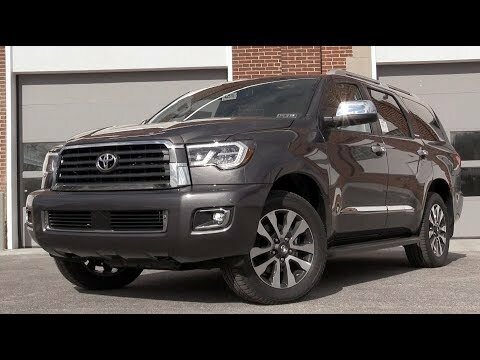 2018 Toyota sequoia trd- the best! I really love the sequoia! We have a family of 5 and my kids are getting bigger. It seats everyone comfortably. I was worried driving a larger vehicle that it would be hard to park and get in or out of places, but the steering capabilities on this SUV are incredible! It is so easy to drive and park everywhere. It is so sporty looking too which I love. The trunk space fits groceries and soccer gear perfect.ly even with the 3rd row up! Best car purchase we have ever made! The sequoia is safe, sleek, and easy to drive. I love my new Toyota sequoia. It has many features that make it a great family car. The safety features alone sold us! Some of my favorite safety features include the rear view mirrors, the back up camera, lane detection, and sudden break. The sequoia also has a cue that signals when you should take a break from driving.